This is a paint program... or at least it will be. It will be a functional clone of the Amiga version of the awesome Electronic Arts' product, "Deluxe Paint", written by Dan Silva. Why do we need another paint program? In a lot of cases, There's no real reason to write yet another paint program, but to be honest, I wanted to see if I could. (And it seems as though I can.) 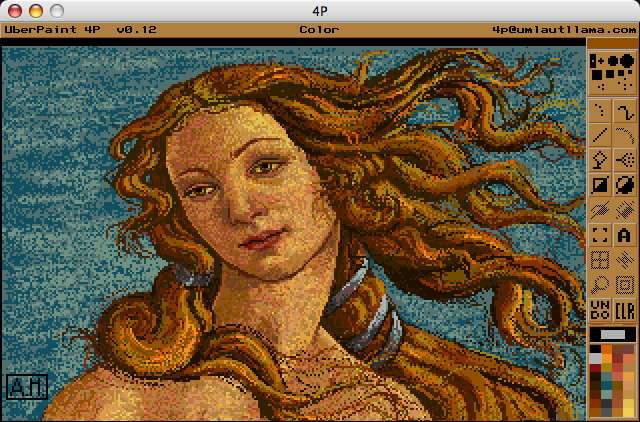 It also can be said that most of the paint programs similar to Deluxe Paint require an antique machine with very a stringent configuration. Such packages as Deluxe Paint on the Amiga itself, Dpaint IIe for the PC and the like. 4P is designed so that it can be easily ported to other computing platforms easily: Linux/Unix/BeOS/MacOS/Windoze. 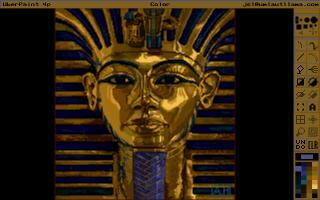 It also won't require DOS (Dpaint IIe) or an Amiga emulator (Dpaint II). 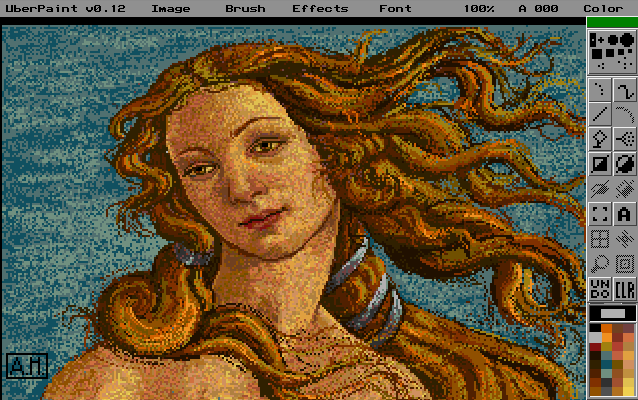 Many people have said that Deluxe Paint was the best tool for editing low-color, low-resolution images in the past. 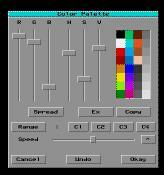 Deluxe Paint also had one of the most straightforward interfaces, and damnit, it was fun to play with for hours on end. I hope to be able to recapture all of this with 4p. Since it will be first and foremost a DPaint clone, It will be able to load in paletted bitmap images, edit them, and save them out. The native format will be IFF-ILBM, even though no one uses it anymore. I decided that since this was a well known format, and all of the images I want to load are in it, it made sense to go with it. I started to work on my own file format, but that was just plain stupid. There will be some kind of support for layering of images, and basic page-flipping animations. There will be support for truecolor images (16,24, and 32 bit) but not until the base DPaint toolset has been implemented. There's support in the program for it right now, but it is untested. There will be animation tools, and eventually, an animated gif export plugin. One of the plugins I intend to write eventually is an Arcade Graphics Importer/Exporter to subsume the functionality of one of my previous projects, Turaco. This will not be an image processing/manipulations tool. If you want that, buy JASC Paint Shop Pro, or Adobe Photoshop. There will not be support for photographic quality images. Truecolor support will be there, but this will not be the end-all, be-all of image editors. It is a low-resolution, low color-depth paint program. So... YAY! the project is revived, but in a pseudo-backburner kind of way. I'm working on it when other projects aren't overwhelming me. I've decided to start with the 0.9 source, not the 0.10, which had some new niceties, but required noweb which was overkill. I've figured out a game plan and direction to get this back on track, and to get 1.0 out at some point before the Leonov gets to to the Discovery. The project is accessible via sourceforget as well. The source is online there, in its current state. Also, while i transition my webspace, there is the new project page for this project. For those of you who are interested, I have the CVS tree for the current developement of 4p (AKA "UberPaint") over on the Zendragon.com server. Check it out if you're interested. :] My life is pretty busy at this point, but I'm trying to work on it in every spare minute of time that I can find. I want to use this thing just as much as you do. Hehe. I know it's been a while since I updated this, but there's something big in the works. (That, and I also needed a break from 4p, and ALL of my time last month was absorbed by moving. I own too much crap.) 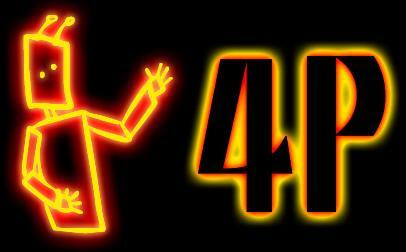 Here's the scoop; 4p version 0.11 will be an almost complete teardown, redesign and rewrite of previous code. I've decided to switch from the GUI layer I was writing (which was intensely slow) to "ParaGUI" which is nice and speedy. It requires extra libraries to be installed on your system, but I think the result is worth it. At the same time, I'm re-structuring some of the design that I was getting uncomfortable with, and also, implementing it in C++ instead of C. This, of course, means that it will be completely Object Oriented. So... sorry about the delay, but it will be very much worth it, I believe. It'll end up being much better than it possibly could have been if I would have just continued with the old code base. And, yes... 0.10 will not be released. There's not much different from 0.9 anyway. heh. FYI; I'm shooting for (and going to miss) a November 11, 2001 release date for 1.0. Sourceforge There is currently a sourceforge SVN repository for this project. This should build, without problems on: Mac OS X, SunOS, Linux, and BeOS. Read the readme file for more information.